Lack of time is one of the most common excuses for not exercising, but the Activ5 is going to stop you putting off workouts and instead help you tone up in just short five minute bursts. The Activ5 is an isometric-based strength training device that isn’t a wearable - you won't be placing this on your wrist. Instead it’s a small block around the size of your palm that you'll squeeze and press to measure pressure in specific strength workouts. It looks a little bit like a stone, but is much lighter and can only withstand 90kgs (about 200 lbs) of force. The aim is to help you tone and strengthen your muscles in short burst exercises provided in an app alongside the device. For example, the app can teach you how to do a chest fly and tell you how much pressure you should be putting on the device. This can be done with a variety of exercises. The Activ5 app has exercises for all over your body and even options for workouts you can do at your desk as well as when standing up. When you first start an exercise, the Activ5 will ask you to mimic the action and push as hard as you can to calibrate it for your strength. It'll then show a graph that tells you how much pressure you should put onto the device. The harder you push, the higher the marker on the graph will go. There are a variety of milestones on this graph that you should try and hit to show you're doing the exercise properly. These workouts can be as short at 30 seconds or up to five minute sessions, but it'll get harder over the length of the workout to push you as hard as possible. Here are the results of the Standing Chest Fly exercise we tried. When you’re done with the workout, the app will give you a muscle control precision percentage so you can see how you fared. In our test we hit all the milestones, but during the workout we were dipping up and down on the chart, so we were quite surprised to see a score of 85%. It felt accurate while doing the workout and when we struggled, the marker on the graph dipped to show that we weren't applying enough pressure. Whether you’re going to want to do these exercises in public or at your desk like ActivBody expects is another matter. Pushing this device between your hands or on other parts of your body does look quite strange so you may want to save it for home or use it in the gym. This is a portable device that's easy to use, but you'll likely need to remind yourself to pick it up on a morning as you can't wear it like other fitness tracking devices. Battery life is a biggest highlight of the Activ5– this device will last for a minimum of six months, according to ActivBody, and it may even last for a whole year with more limited use. The app is the another high point of the Activ5 tracker though. You’re given over 100 workouts to do with personalized difficult levels so it's always going to be relevant for you strength. 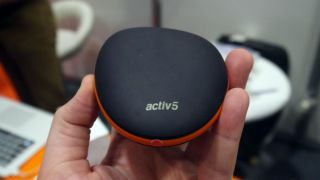 The Activ5 is currently not available for those in the UK - we've been told it should launch in the next six months - but if you live in the US you can buy one for $179.85 (£150, AU$235). In terms of normal fitness tech, the Activ5 is one of the stranger things we’ve seen on the market and may be the thing you need to buy to help tone up in only a few short minutes a day.